The Marshall MG15CFR guitar combo amplifier gives you that great Marshall tone and two awesome channels in a very compact package! The 15-watt MG15CFR includes a great-sounding 8" speaker, two switchable channels (clean and overdrive) with their own controls, built-in reverb, and a 3-band EQ that lets you shape your tone. If you want to play along with your favorite tunes, this amp has a line-in that lets you plug your MP3 or other music player right in! 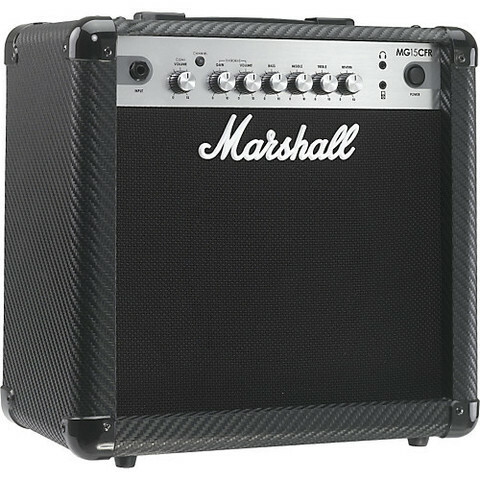 And silent practice or direct recording sounds great, thanks to a speaker-emulating headphone/line-out built right into the Marshall MG15CFR combo amplifier. The Marshall MG15CFR packs historic Marshall tone in a tiny combo that's perfect for practicing at home or on the go. It may be small, but the sound is huge. 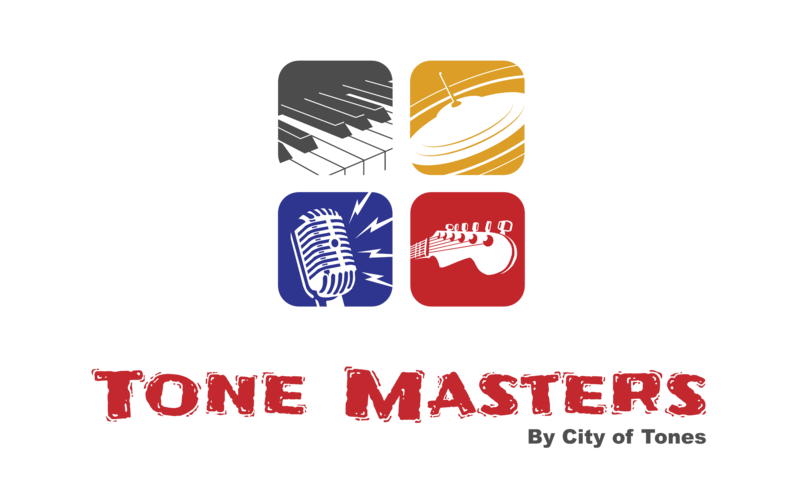 What's the best way to improve your playing? Jamming with your favorite guitar stars! 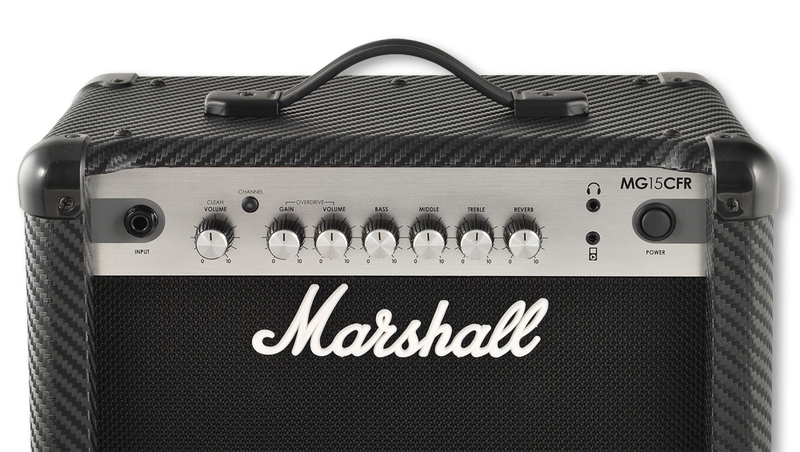 Just plug your music into the front of Marshall's MG15CFR combo amp with an 1/8" stereo cable, match your guitar's volume to the music, and play away. 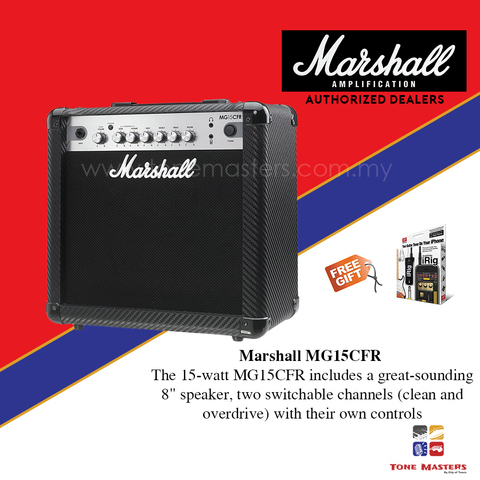 And for late-night practice sessions, you'll love the sound of the MG15CFR's speaker-emulated headphone output. Practicing with headphones doesn't have to sound weak, thanks to the Marshall MG15CFR's speaker-emulated headphone output. No matter what kind of headphones you use, you'll hear the sound of a great speaker cabinet instead of a dry, fizzy direct signal. The speaker emulated output doubles as a line output for direct recording, so you can record great tone even when setting up a mic isn't an option.